The showcase itself will take place March 20-22 of next year, during the final three days of GDC 2019. Teams for each submission chosen will be asked to showcase their game to GDC attendees at the Alt.Ctrl.GDC exhibit area; they’ll also receive a pair of Main Conference+Summit Passes and a pair of Expo Plus Passes, for a total of four free passes to GDC 2019! Alt.Ctrl.GDC is a unique game industry event, one that offers fresh perspective on how and why people play games. It can be tricky to sort out what's a good fit for the showcase, or how to take your submission from a side project to a showcase standout. 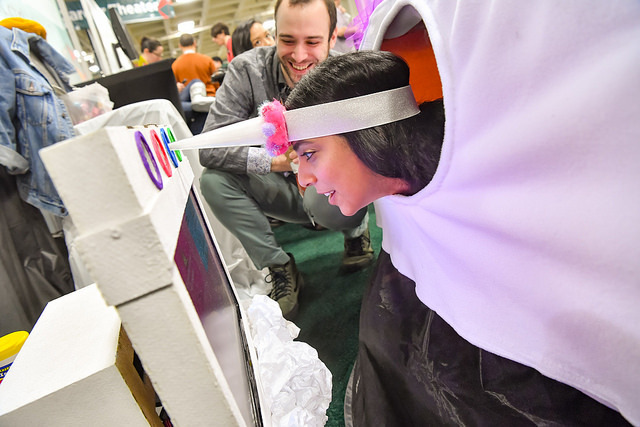 If you're looking for a bit of inspiration, consider that last year Alt.Ctrl.GDC visitors at GDC 2018 got to battle the undead by bopping plastic zombie heads in time to the rhythms of Disco is Dead, pour and mix actual drinks to get in the spirit of Yo, Bartender, and cooperatively scan and vaccinate (with a real physical injector controller) an ailing patient in Vaccination! For the third year in a row, one of the games selected to be part of the GDC 2019 ALT.CTRL.GDC showcase will also win the ALT.CTRL.GDC Award ($3,000) at the IGF ceremony during GDC, with judging taking place on-site. In exchange for the passes and free exhibit space, teams will be responsible for their own travel and the delivery of their exhibit submission to GDC in San Francisco. Those interested in participating in Alt.Ctrl.GDC should fill out this online form in its entirety. Any questions about the form or the exhibit should be directed to ALT.CTRL.GDC’s organizer, John Polson. This will be the sixth year that ALT.CTRL.GDC appears at GDC, and organizers are looking forward to the remarkable outpouring of creativity and ingenuity that has become a hallmark of the interactive exhibit. Organizers are also preparing a host of other exciting interactive exhibits for the upcoming GDC which will be announced in the coming months. GDC 2019 will itself take place Monday, March 18 to Friday, March 22, 2018 at the Moscone Convention Center in San Francisco, California. More information about Game Developers Conference 2019 is available via its official website.